The US opioid epidemic is causing drug overdose deaths to skyrocket – to an unprecedented 64,070 in 2016. That’s more Americans killed than by the Vietnam War. In the same year, opioid misuse caused a record number of fatalities in the UK. The opioid black market in Australia is thriving and there are fears the country is headed in the same direction as the USA. The good news? You can heal from opioid addiction at a professional drug addiction rehab centre. What triggered the US opioid epidemic? Back in the 1980’s, doctors and several studies claimed that the risk of addiction to opioids was low. Drug companies aggressively promoted them as a way for patients to manage long term pain safely and effectively. In response, doctors prescribed more and more opioids to treat pain patients. Some physicians claimed withholding opioids was a form of under-treating them. Everyone believed chronic pain sufferers had found relief at last, and a growing body of literature seemed to confirm opioid drugs could be used safely, long-term, with little risk of addiction. Nowadays, we know the facts are different. Dr. Russell Portenoy, a prominent proponent of narcotic painkillers in the 1980s, says, We didn’t know then what we know now. Widespread opioid abuse has created an addiction and death epidemic in the US. Other countries like Canada, the UK, and Australia seem to be following at an increasingly rapid pace. Who is dying from opioid overdose? The National Household Survey on Drugs questioned tens of thousands of Northern Americans. They found people who develop new addictions to opioids are usually not pain patients. Only a small number of people who misuse opioids obtain them directly from a physician. Instead, opioids are most frequently misused by young friends and family of pain patients. In fact, half of new users questioned claimed to get their drugs from a friend or family member for free. Middle-aged patients who seemed to be newly addicted had usually relapsed from a previous addiction. People abusing opioids are often (but not always) individuals with an interest in or past history of drug use. For example, a recent study of people addicted to OxyContin showed that the majority had also used cocaine. Which opioids are the killers? Fentanyl, poster boy for the US opioid epidemic, is a synthetic opiate prescribed in carefully managed doses to treat pain. The drug is much stronger than morphine and its analogue, carfentanyl, is ten thousand times stronger. Just 0.002g of the drug is potentially fatal. You probably heard a lot about fentanyl in the news when Prince died after accidentally overdosing on it. In Australia, cooking up and using DIY fentanyl is nicknamed Russian roulette. Users cannot predict how potent and potentially fatal each hit will be. The UK National Crime Agency reported that drug dealers mix fentanyl and carfentanyl with Class A drugs such as heroin, which increases risk of accidental overdose. In the USA drug fatalities involving fentanyl have increased 540% since 2014. In fact, opioid, cocaine, and methamphetamine deaths combined are killing people faster than the HIV epidemic at its worst. 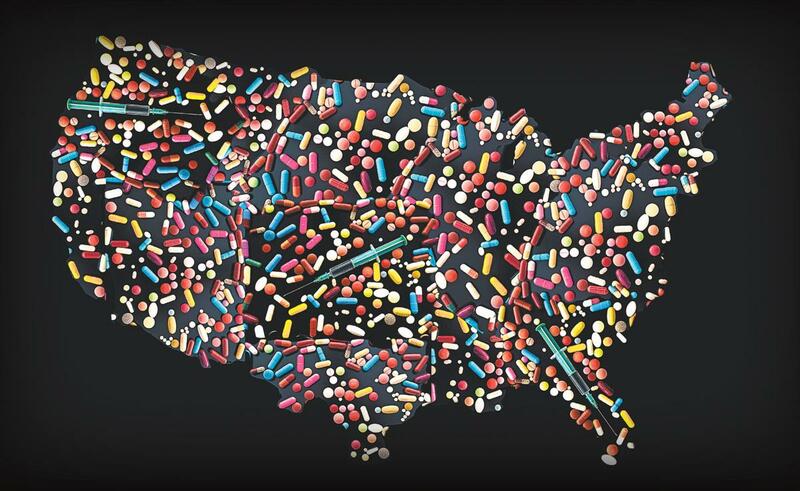 Using anecdotal reports from health departments, coroners, and medical examiners, The New York Times predicts the US opioid epidemic will only get worse. Other prescription opioids people frequently misuse include Percocet, used to reduce pain and fever, and OxyContin, used to treat continuous pain for a short time. How accurate are these US opioid epidemic statistics? Worryingly, the statistics probably do not represent the true extent of the worldwide opioid epidemic. The real number of opioid-related deaths is probably much higher. Full-blown autopsies are expensive, especially with new strains of fentanyl requiring much more rigorous testing to detect. Insufficient budgets struggle to cover the extra cost, so fentanyl testing only happens when there is a specific reason to do so. The opioid epidemic is hitting small town USA hard. West Virginia has the highest drug overdose death rate in the country, but this data may be under-representative of the true crisis. Small town coroners sometimes willingly mislabel death certificates for families who want to avoid an overdose death certificate. Most US counties have lax laws regarding how qualified a coroner needs to be, leading medical experts to question whether or not death investigations are always carried out adequately. If you or someone you know is addicted to opioids, help is available. The Dawn is an affordable luxury rehab in tropical Northern Thailand. We are one of Asia’s leading drug addiction rehab centres. Our personalised 30-day treatment programmes help you overcome opioid addiction and avoid relapse. Your tailor-made programme can include therapy, medication, counselling, and tools to ensure your long term recovery. If you need to detox from opioids, you will be cared for and supervised 24/7 in our licensed onsite medical detox facility. We combine Western therapies like Cognitive Behavioural Therapy, Contingency Management, and Motivational Enhancement Therapy with Eastern practices including massage, gentle yoga, and simple meditation. The result? Safe, effective programmes in an affordable luxury rehab to help you overcome addiction. Contact us today for a relaxed, confidential chat with a drug addiction professional. Do not become another opioid overdose statistic.